The U.S. Department of Energy issued a permit (late 2016) giving federal approval for Minnesota Power’s plan to bring electricity into Minnesota from the Canadian hydroelectric dams. Construction of the Great Northern Transmission Line will bring clean, emission-free energy into Minnesota. This development will help meet growing demands for energy while simultaneously improving the reliability of the distribution system. 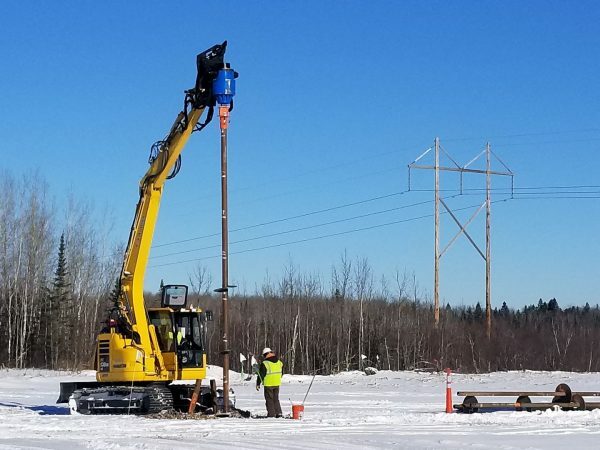 At a cost (for the Minnesota portion) of $560 million, the 500 kV transmission line will connect Manitoba with Minnesota’s Iron Range. Spanning a distance of 224 miles, the Minnesota portion of the line will start in Roseau County and run to an expanded electric substation at Blackberry (just east of Grand Rapids). The project will also include the construction of associated substation facilities and transmission system modifications. The large scale of the project was subdivided into four separate segments. Hooper is pleased to partner with Wilson Construction on a joint venture to work on the first two segments. Initial construction began in December 2017. The wet, swampy, and boggy terrain required that the foundations be installed in the winter months when the region would be frozen. To complete the project, a series of ice roads were created to provide access for equipment. Work on the foundations had to be complete by early March, prior to the warmer spring weather. 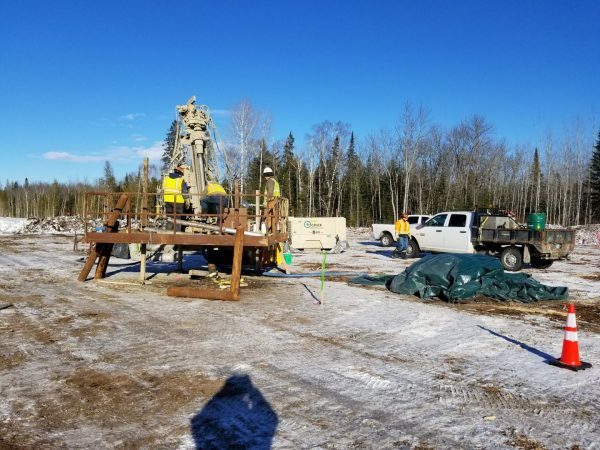 There are three main foundation types that are being installed – helical piles, micropiles, and drilled piers. Structure type, span length, and soil conditions all determine the type of foundation. Helical piles- These are long steel shaft foundations that are turned deep into the soil to hold up the foundation cap. The majority of the foundations will be helical piles. Micropiles- These long steel shaft foundations are drilled and grouted into the soil to support the structure foundation. These are used where soil conditions prevent the effective use of helical piles, such as shallow bedrock or very rocky soils. 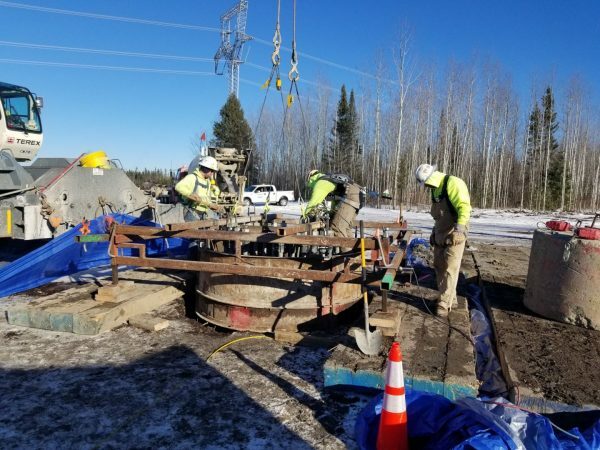 Drilled piers – This is a deep foundation system that is a large diameter concrete cylinder constructed by placing concrete and reinforcing steel into a drilled shaft. Helicopters will begin carrying structures this spring and summer and the entire project is expected to be complete in June 2020.